In the 1990s this was quite a happening spot. On the left, for decades, was Sakkio Japan, one of the most popular restaurants in the food court (I don't recall what was on the right). Their staple item was the teriyaki chicken combo. They would frequently have a crier providing free samples. But even Sakkio Japan closed up shop when the foot traffic dried up. The tiles on the floor actually tell the story of this area's former use: the white and green tiles in the foreground were where the tables were located. The pink, green, and white tiles in the background were the open aisles where people would walk by and approach the store fronts. Even that patch of black tiles in the center of the shot tell a story: the garbage can used to sit there. 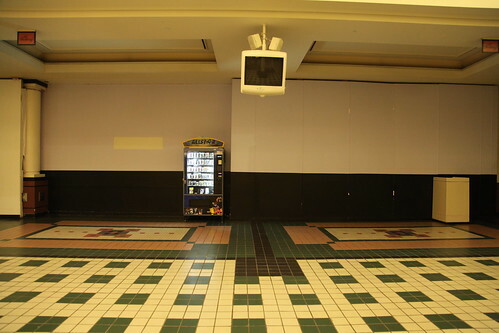 It's rather amazing that someone even bothered to try and operate a vending machine there in the mall's final years. It was filled with out of date baseball cards - a fitting anachronism for an outdated mall.